Our littlest cookie decorator is almost five now and doing fun things with cookies! 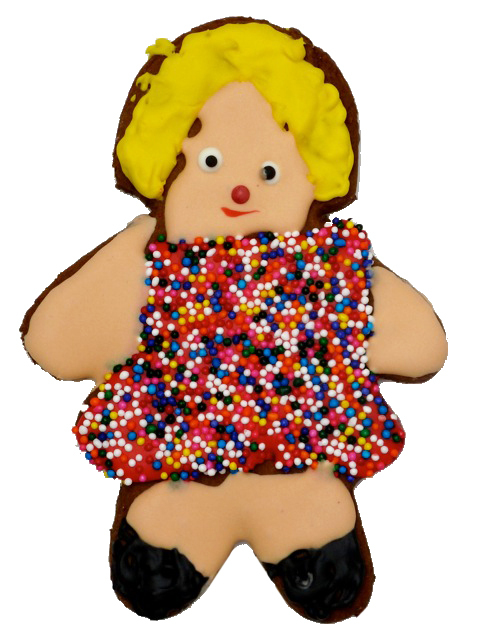 She wanted to make a gingerbread girl cookie with hair, not a gingerbread boy. And so her mother cut out a girl for her and here she is. (I think she's chocolate but that's okay too.) I love the dress! And where are all of our decorated cookies for Christmas? Jill and mine didn't happen and Nina's are still in her computer - which is having a problem. We all made cookies in case you think our family had to do without - just not decorated cookies to post on this blog. I made Lebkuchen (Honey Cakes - from an old German recipe) and Pecan Balls (Mexican Wedding Cakes), Nina made Gingerbread Men and Jill made Spritz. It's what we always do and they are so GOOD! I will post the recipes one day. Look under CHRISTMAS for more cookies.